F Yeah, It’s So Great to Be a Berkeley Student! 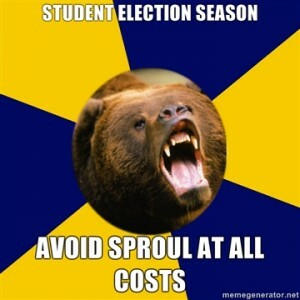 The inaugural Berkeley Student Bear meme. The meme’s witticisms hit close to home, capturing every frustrating, quirky particularity of Berkeley student life. The About page, however, refused to tell us anything at all about the mastermind behind the magic, so we corresponded with the clever creator herself to bring you everything you wanted to know (and didn’t) about this entertaining Tumblr.